The Blue Angels overhead at the New York Air Show. The speed of the Sigma 100-400mm F5-6.3 DG OS HSM | Contemporary allowed the lens to keep pace with everything the airshow could throw at it, from propeller crop dusters to a P-51 Mustang to the acrobatic Blue Angels to the blazingly fast F-35. The Sigma 100-400mm F5-6.3 DG OS HSM | C lens is a product that brings to mind the idiom “don’t judge a book by its cover,” thanks to a combination of unassuming design and spectacular performance. The budget-minded lens offers autofocus performance and image quality that rival lenses at double the price. While it’s designed for full-frame cameras, APS-C users end up with a lens with an equivalent focal-length range of 160-640mm. 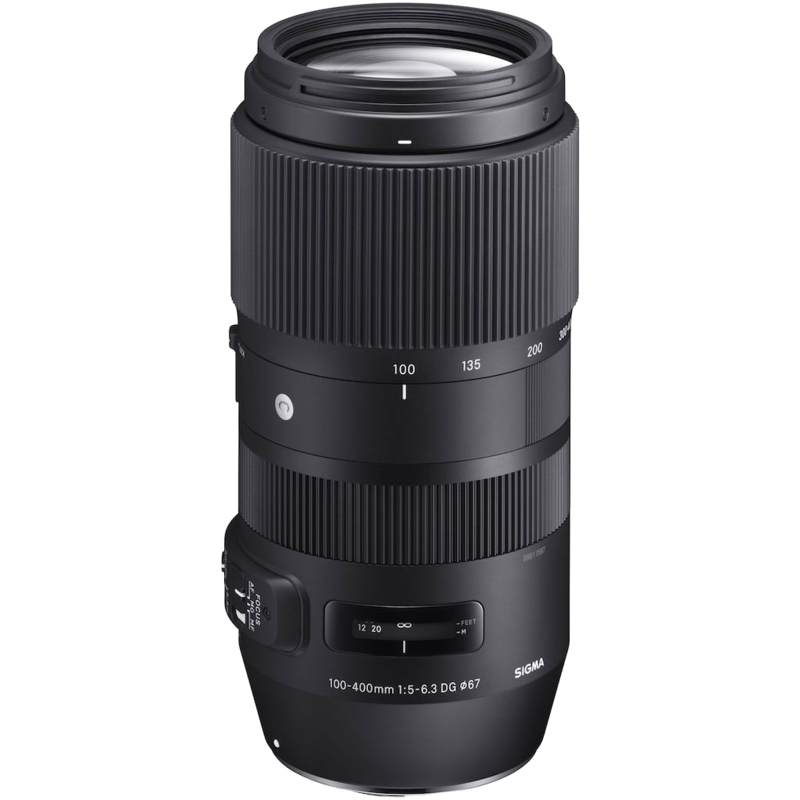 Sigma’s marketing materials suggest the 100-400mm lens is ideal for “travel photography, wildlife photography, nature photography and bird photography,” thanks to the compact size, low weight and affordable price. The $800 lens weighs just 40.9 ounces—around one pound lighter and just a touch shorter than the $1,600 Canon EF 100-400mm F4.5-5.6. Nikon has the AF-S NIKKOR 200-500mm F5.6E ED VR, which we reviewed (digitalphotopro.com/reviews/af-s-nikkor-200-500mm-f5-6e-ed-vr/) and consider one of the best bargains in the super-tele world, and the older (but excellent) 80-400mm F4.5-5.6 ED VR. While Sigma might have designed this lens for bird photographers, I put it through its paces with a much more demanding bird, photographing the fighter jets at the New York Air Show. 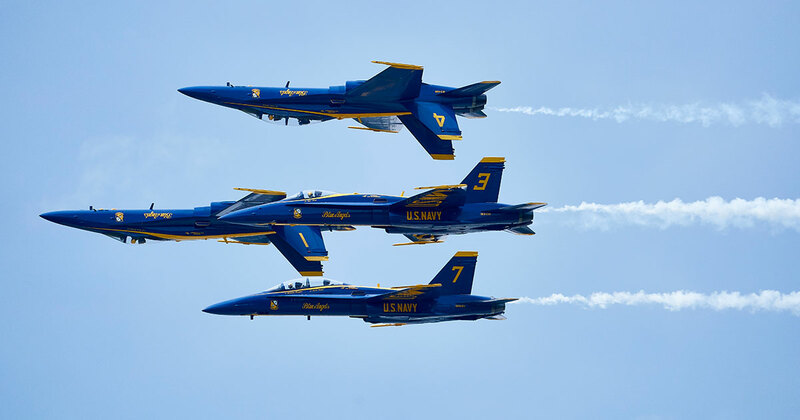 Many of the demonstrations, including those from the Blue Angels and the F-16 Tactical Demo Team, move at speeds just under Mach 1 (more than 700 mph) and is the ultimate test of the focusing capabilities of a lens and a camera’s AF system. I coupled the Sigma 100-400mm F5-6.3 DG OS HSM | C to a Canon EOS 5D Mark IV, which uses the same AF system as the Canon EOS-1D X Mark II, yet is light enough to handhold all day while panning with fast-moving planes. I also shot this event side-by-side with the radically more expensive ($2,500) Sony 100-400mm F4.5-5.6 GM OSS lens, coupled to a Sony a9. This lens-camera combo is arguably the fastest in the world, and made a great competitor for the Sigma. The Sigma 100-400mm kept pace with everything the airshow could throw at it, from propeller crop dusters to a P-51 Mustang to the acrobatic Blue Angels to the blazingly fast F-35. Between the AF system of the 5D Mark IV and the speed of the lens, the 100-400mm kept up with the action. The Sony 100-400mm F4.5-5.6 GM OSS coupled with the a9 naturally focused faster than the Sigma 100-400mm F5-6.3 DG OS HSM | C, but the Sigma was still fast enough to keep up with the action. On the day before the actual show I headed to the airbase for a media briefing and interview session with some of the pilots. After the event, two of the Blue Angels started rehearsing a low pass over the airfield. I grabbed the Sigma lens and captured run after run of the two jets approaching nearly head-on and then screaming across the treetops. This gave me a good opportunity to test the focus with a repeatable, fast-moving object and there are barely any shots out of focus, which is great for a lens of this price. 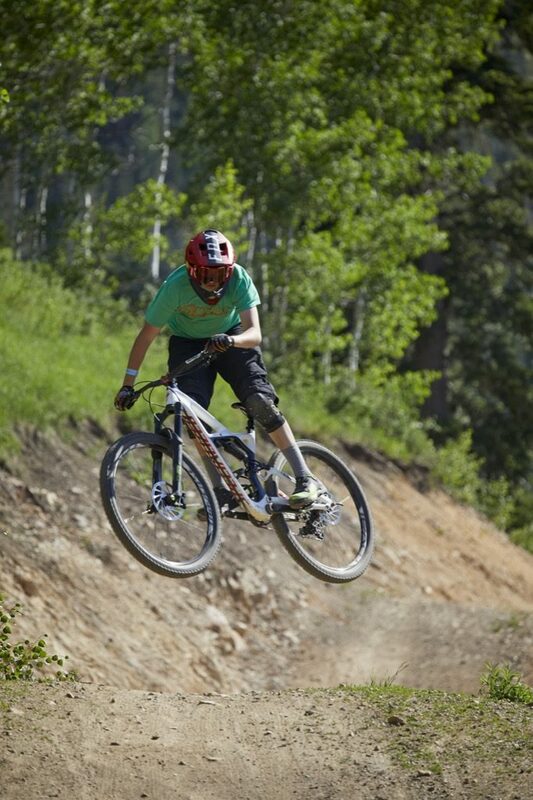 I also took the 100-400mm lens to a media camp in Utah where I used it as a more traditional sports and landscape lens. On one shoot of mountain bikers hitting a dirt jump, I could capture the peak action of the jumps, even though from my vantage hunkered down on the trail with the jump above me I couldn’t see them coming, and so didn’t start focus until their heads peeked above the jump. Even with a rapid focus like this, the lens barely missed a shot. The Sigma 100-400mm F5-6.3 DG OS HSM | C lens is light enough to take anywhere and fast enough to capture any action. The wide zoom range allows photographers to get the right perspective. Part of this stability in focus is due to the image-stabilization built into the lens, which helps balance out the fact that the minimum aperture is ƒ/5. While panning with the planes I could see the image stabilization in action, but it wasn’t nearly as jerky as some early-generation image-stabilizing systems, where a fast-moving subject during handheld shots seems to jump around the frame. That said, the image-stabilizing systems in more expensive lenses do seem better able to cope with exaggerated hand movements at slow shutter speeds. The 100-400mm focal length is great for travel, landscapes and general sports, though it’s a bit short for longer events like the airshow or distant wildlife—you’re not going to capture a moose in the brush a mile off with a 400mm. Generally, I shoot an airshow with at least a 500mm lens, as most of the peak action shots occur with the planes at a bit of a distance. For the mountain bike shots, the 100-400mm length was perfect, as it allowed me to either get headshots, wide action or tight action shots with a single lens. The Sigma 100-400mm F5-6.3 DG OS HSM | C feels good in the hand, with good balance. On the Canon EOS 5D Mark IV, the body and the lens both felt like they were working together to create a nice, solid package. I also put the lens on the Sony a9 with the Sigma MC-11 adapter, and the size of the a9 made the lens feel a bit more forward-heavy (especially with the added length of the adapter) but still well balanced. The switches for the AF mode, stabilizations and custom settings don’t feel flimsy, as is the case with many budget lenses, and they weren’t prone to getting shifted from brushing against the side of the camera bag; on very few occasions did I lift the lens to find it not in AF mode. Barrel movement is smooth and consistent across the focal length. There’s less distance between the 300-400mm range than there is between the 200-300mm range (by design), so photographers essentially have a smooth range of focus distances from 100-300mm, then a little more movement goes right to 400mm. This is a bit odd for sports and landscapes but great for an airshow. The lens doesn’t have its own tripod collar/mount, as do many super-tele lenses, so if you’re looking to work with it on a tripod or monopod you’ll need to mount the support to the camera instead of the lens. Thanks to the laws of physics, there’s going to be some trade-off when trying to make a super-tele zoom that’s both compact and affordable. In this case, Sigma has chiseled off a bit of the aperture range, making this lens ƒ/5 at the widest and ƒ/6.3 at longest reach. Obviously, a lens at ƒ/5 has a different look than one at ƒ/2.8, so shooters looking to get smooth background blur on close-up subjects will need a different lens. However, not all scenes require a wide aperture. Careful framing of the mountain bike jumps allowed me to place blurred pine trees behind them, and you don’t need anything wider than ƒ/5 when shooting fighter jets or landscapes. Of course, shooters with APS-C systems would see this lens’ focal length function more like a 160-640mm lens, which opens all sorts of possibilities. The image quality of the Sigma 100-400mm F5-6.3 DG OS HSM | C is good, though it’s not on par with higher-priced lenses, especially at the 400mm range. In bright sun, like the mountain bikers jumping, the quality is excellent. At the longer distances, a bit of softness creeps in, especially in low-contrast scenes. This is expected for a lens at this price point—it’s one of the trade-offs for the size and price of this lens. Last year, I reviewed the Sigma 150-600mm F/5-6.3, priced at about $1,100, which provided crisper images and a wider reach, but is significantly longer and less compact. Part of this is the longer length of the 600mm lens—at a longer telephoto setting the same objects occupy more of the sensor and so resolve sharper—but for the serious sports and wildlife photographer, it would be good to consider spending $300 more and getting 200mm greater reach. For the occasional sports and wildlife photographer, birding photographer or travel photographer, the Sigma 100-400mm F5-6.3 DG OS HSM | C is an excellent all-around lens, with only a few compromises to bring the price, size and weight down. It doesn’t quite match the focus speed or image quality of the highest-end super-telephoto lenses, but it comes much closer than the price point would imply.